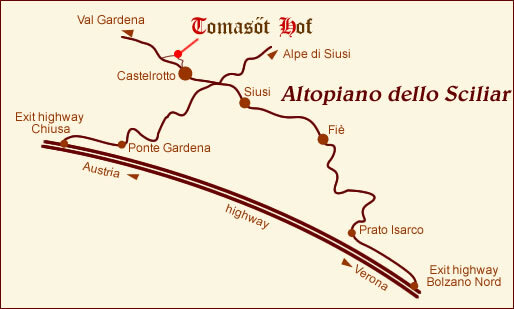 Coming from the North: take highway exit A22 Chiusa – Alpe di Siusi, follow the SS12 to Ponte Gardena and then continue until you reach the village Castelrotto. After the store "Konsum Market" turn right in the "Via Tiosler" and after 1,5 km you will find on the left side the farm "Tomasöthof". Coming from the South: take highway exit A22 North – Alpe di Siusi, follow the street to Prato Isarco and from there to Fie, Siusi and then Castelrotto. After the store "Konsum Market" turn right in the "Via Tiosler" and after 1,5 km you will find on the left side the farm "Tomasöthof". With Google Maps you can look at the road system. Trains stop at Bolzano and Bressanone where you can go on with a bus. 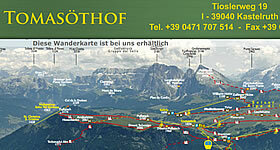 The closest airports are in Bolzano (25 km), Innsbruck (120 km) and Verona-Villafranca (180 km).